Maintaining the ideal level of indoor comfort is what all homeowners desire — but in the winter months, it can be difficult to do just that. The frigid cold of Minnesota winters brings with it dry air while depleting humidity levels. Having the correct level of indoor humidity can make your home a more comfortable and healthier place to live. One way to maintain the ideal humidity level is with a humidification system, such as a humidifier, which increases the level of moisture of your indoor air. With more than 25 years of experience, Bloomington Heating & Air knows how beneficial a humidifier can be for Minnesota homeowners dealing with dry winter conditions. For more information on choosing the best humidifier for your home, contact our HVAC repair company. On a hot day, humidity can make you feel warmer — the same goes for humid weather on a cold day. 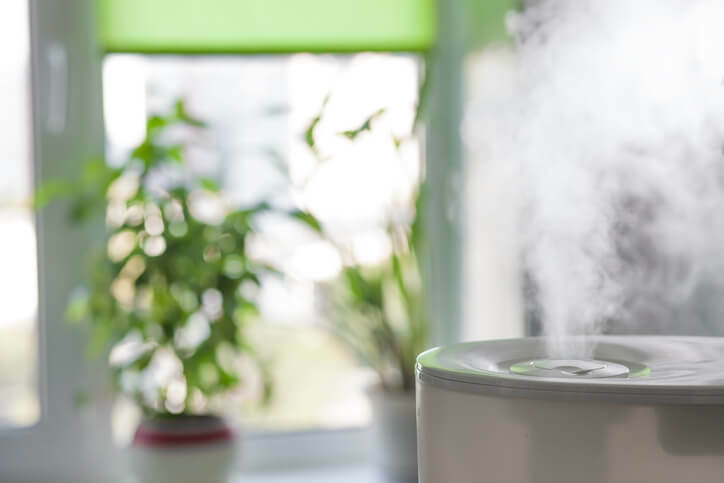 Humidifiers add moisture to the indoor air, making it more difficult for your body to lose warmth through perspiration while trapping additional heat. Adding a humidifier to the home can also help reduce heating costs, by promoting indoor warmth with humidity instead of turning up the thermostat. Additionally, residential humidifiers can even improve the functioning ability and longevity of your HVAC system by reducing the number of airborne pollutants and allergens that can accumulate and cause system issues. If you’re looking to improve the level of indoor air quality in your home, a humidifier is your answer. Humidifiers improve air quality by reducing the circulation of airborne irritants, like dust, pollen, and other allergens. The fewer the particles of dust in the air, the higher your air quality will be. Additionally, too much humidity in the home can be hazardous to the health. Too much moisture indoors can cause mold and mildew to grow and spread, wreaking havoc on your health. But just as a humidifier can add moisture to the air, so too can it regulate the humidity levels of your home, preventing the mold and mildew from forming. With plentiful moisture, air from a humidifier can naturally replenish dry or itchy skin and prevent the recurrence of surface irritation. Moist air can also improve respiratory health, particularly during allergy season, as humidity soothes dry noses, scratchy throats, and irritated eyes. Throughout the winter season, the incidences of cold and flu seem to spike, but a humidifier can reduce the risk of these illnesses by improving the level of indoor air quality — inhibiting the proliferation and spreading of viruses and germs. What’s more, if someone in the home catches a cold or flu, the proper level of residential humidity can help sooth symptoms, such as congestion. Low humidity causes moisture to escape from wood, causing it to crack, dry out, and/or shrink. Dry air also leads to paint peeling off walls, furniture, and other home surfaces. With balanced humidity, a residential humidifier can serve to protect some of your most valuable belongings as well as your home’s structure. Additionally, humidifiers are associated with decreased levels of static electricity in the air, which can also make your home feel safer and more comfortable. Since humidifiers are available in different sizes and configurations, finding the correct device for your home is easy. If you have a single room in your home that requires an increase in humidity, a stand-alone humidifier is a great option. The advantage of a stand-alone humidifier is the versatility of moving it between rooms. However, different room sizes require different units. Also, a stand-alone humidifier needs to be refilled with water and operated manually. On the other hand, if you want to maintain the ideal humidity level throughout every room in your house, a whole-home humidifier is ideal. Whole-home humidifiers require less effort from the user because the water supply required for function comes from your home’s HVAC system. Whole-home units also tend to be quieter and provide more consistent humidity levels for small rooms compared to stand-alone humidifiers. Additionally, a technician can provide upkeep to your whole-home humidifier during routine HVAC maintenance.